During fire service interventions, positive pressure ventilation (PPV) systems with mobile fans are often used to try and make (or keep) a staircase smoke free and to remove smoke from the fire rooms. The positioning (distance from the door opening) and inclination angle of the fan determine the effect of the PPV fans in the staircase. In the present paper results are discussed of an experimental study, performed at full-scale. Based on different sets of cold experiments, the impact is quantified of: the distance between the fan and the door; the inclination angle of a single fan; and the use of multiple fans. The closer the single fan is put to the door opening, the more effective the PPV becomes. Obviously, there is a trade-off with effectiveness of the fire service intervention, since the fan must not block the door opening. With respect to inclination, it is best to apply an inclination angle of 75° (i.e., an upward tilting of the fan axis by 15°, which is the maximum value tested) for ventilation at ground level with the fan tested. This ensures safety in the case of fire at ground level due to full coverage of the entry door opening, while only a relatively limited loss in PPV effectiveness is observed compared to a horizontal fan (in some cases, the PPV effectiveness is even higher with inclined fan). When the fire room is at a higher floor, an inclination angle of 90° (i.e. horizontal fan axis) can generate a higher average flow velocity, depending on the staircase configuration inside the building. If two fans are used, V-shape positioning is shown to be more effective than a set-up in series or in parallel. A V-shape with inner angle of 60° between the fan axes is more effective than an angle of 90°. If three fans are available, still higher average flow velocities are measured. Positioning two fans outside in V-shape and one fan inside at the bottom of the staircase is more effective than putting the three fans outside, On the other hand, the latter set-up may be required for firefighting tactics. 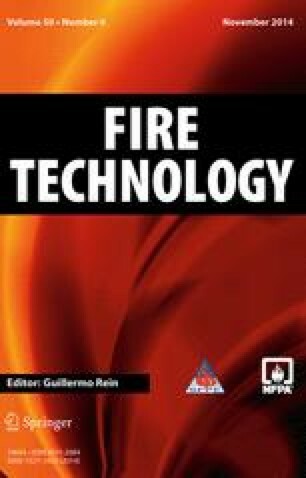 This paper is a summary of the thesis of Lambert , performed in the context of the Postgraduate Studies in Fire Safety Engineering at Ghent University. The first author greatly acknowledges the financial support from KCCE, the Belgian center of expertise for the fire service, the material support of the Brussels fire department and the campus VESTA. The authors also acknowledge Associate Professor Stefan Svensson (Lund University) for his valuable comments during the research. Finally, the authors thank Bart Noyens and Ruxandra Darmon for the illustrations in this paper.